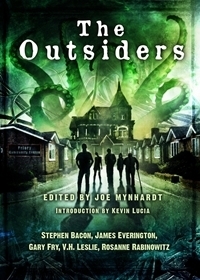 The Outsiders is a really cleverly written horror anthology featuring some pretty fine horror talent from critically authors such as Stephen Bacon, James Everington, Gary Fry, V.H.Leslie, Rosanne Rabinowitz and Kevin Lucia contributing the introduction.I loved how these stories were written by different authors but the stories work really well together creating a really quirky horror anthology. What's really clever about this is that the five stories all are centred around a mysterious cult like gated community known as Priory. In this very small and secular society they worship a strange eldritch sea creature who communicates via colours offering them wisdom and enlightenment in return. The cult is headed up by a nefarious Charles Erich who is worshipped, adored and feared by his fellow residents all hand picked by him to come an live inside Priory an exclusive neighbourhood that everyone wants to live in. At first glance it seems the perfect neighbourhood, no crime, everyone looks after each other and lives in perfect harmony. Yet underneath the surface, literally, lives the sea creature older than humanity that they worship. Caring for this beast comes at a price it must be fed, with souls. In the first tale, The Subprime by Gary Fry we meet a young 19 year old boy Lee Mann who has always lived his life as an outsider growing up in a broken family, always having to fend for himself. He's determined to make the best of himself which he starts to do after accepting a dream job selling mortgages for Mr Phillips a resident of Priory. However soon he starts to have seconds thoughts regarding the ethics of his new boss and soon tries to find a way out. Impossible colours by James Everington sees a police community support officer investigate the apparent suicide of a local man, Marty Young. Everyone has written him off as a mad man but as she investigates his death further she finds some disturbing information regarding the exclusive gated community in Exham town. She also learns that her and Marty are not so different after all. Stolen From the Sea, by Stephen Bacon, follows the story of a grieving father who yearns to leave Priory after falling in love with another woman following the death of his daughter. He yearns to be free again and together with his new love, they hatch a plan to run away. Precious Things by V.H.Leslie, witnesses the demise of a long and stable marriage. Petra soon yearns for more than what her increasingly distant husband Bernard can offer. As she tries to rebuild the bridge between them she soon realises he is keeping secrets from her. In the final tale, Meat Motion and Light by Rosanne Rabinowitz we find the tale of Claudia who managed to escape the repressive Priory. Now she's free to do whatever she wants, be the person she was always meant to be. But her mother, still living at Priory calls her back to return to Priory. It's a call she can't ignore despite the many warning from those closest to her. This movie is interesting and horror I am too much enjoy this movie with friends. I am also submitting a online reviews about this movie and also suggest my friends must watch this.